Although Australia has a small population when compared with many other countries that have competed at the Olympic Games, our athletes have performed remarkably well, consistently winning medals for their country. Find out about the first Olympic Games in which Australia had a competitor and what the result was. Who was the first woman to compete and did she win a medal? With historic photographs and a complete list of medal winners, this book will be an inspiration to all the aspiring young athletes who dream of competing for their country. 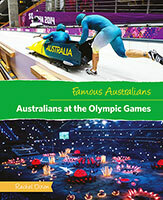 There are also sections on the two Olympic Games held in Australia and details on the economic, political and sustainability issues that they faced. Famous Australians presents short biographies of people who have made notable contributions to society, and who have helped make sport and children's literature such important and popular aspects of Australian culture.